The heart wants what the heart wants, ask any women, and she’ll say she wants chocolate this Valentine’s Day. I wonder why this is? Could it be because chocolate is delicious and melts in your mouth. Well yes. But could it also be because chocolate has a greater purpose for your body? YES. Dark chocolate has been proven to help with circulatory health, according to Everyday Health article listed below. “Pregnant women who nibble just a small piece of chocolate each day may improve the circulatory health of their unborn child, a new study suggests. The tiny treat may also reduce the risk for preeclampsia, a potentially deadly condition in which a pregnant woman with normal blood pressure suddenly develops dangerously high blood pressure”. So while you are considering what to get for Valentine’s day, treat your tastebuds and your body with some love and get yourself dark chocolate! Also, don’t forget to wear your compression stockings to help with circulatory health as well! They’ll help you feel rejuvenated, and trust me, your legs with thank you! Check out the article posted below to learn more about the health benefits of eating chocolate during pregnancy. How does compression help with Edema? Compression is used by patients that suffer from a condition known as Edema. Edema is the result of an accumulation of fluid under the skin and most of the time affects the circulation in a person’s lower legs, ankles, and feet, causing obvious swelling. The use of compression stockings, sleeves, and athletic socks helps increase blood flow by applying pressure to the lower legs, providing a firm grip on the ankles, and decreases the pressure as it progresses up the leg. If you suffer from swelling in your lower legs, ankles or feet, talk to your doctor about compression stockings. Should EVERYONE Wear Compression Stockings? If you fall into any of these categories, graduated compression stockings would help you. They increase circulation and help pump the blood back up towards your heart like your veins are supposed to do. 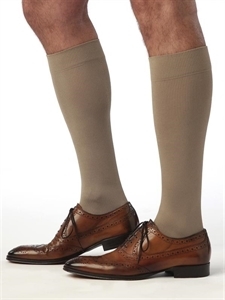 Graduated compression socks/stockings help reduce swelling in your feet and ankles, prevent blood clots, and slow the progression of varicose veins. So, the answer is yes. Everyone, at some point in their lives, would benefit from graduated compression stockings.